‘Dear Amberley’, as it is affectionately christened by the official village history, is a lovely hodge-podge of styles, materials, periods and flower-draped walls set beneath a great wooded bluff of the South Downs more reminiscent of the Tyrol or the Highlands than of Sussex. 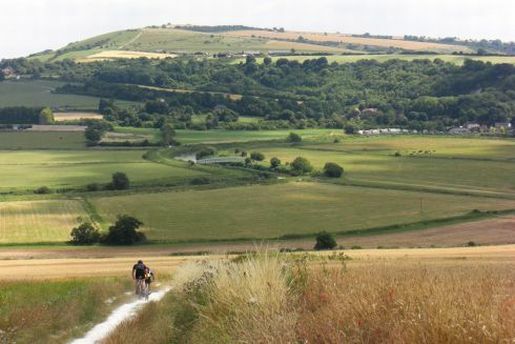 It is a convenient halt for hikers along the prehistoric South Downs Way with welcoming pubs, a village shop and a pottery. Across the end of a most attractive cul-de-sac, bordered by creeper-hung stone walls, is St Michael’s Church, backed in turn by the broad-shouldered remains of Amberley Castle. The story of the church goes back to 681, when the land on which the village now stands was given to St Wilfrid by the Saxon King Cedwalla, whom he had converted to Christianity. Much of the building, however, dates from shortly after the Norman Conquest and is the work of Bishop Luffa, who also built Chichester Cathedral. The interior of St Michael’s is high, bare and silent, its roof supported on massive stone pillars. To the right of the lovely, worn chancel arch – part of Bishop Luffa’s contribution – are faded purple wall-paintings of Christ in Majesty and the Ressurrection, dating from the 12th century. Among the few but charming monuments are a brass of a knight wearing the armour and surcoat of the Agincourt period, and a poignant portrait plaque to a girl who died in 1919, aged 17 – ‘A Dear Child’, reads the inscription. In the tower is a peal of five bells, which were cast and hung in 1742. The peal is one of the lightest in Sussex. Amberley Castle is also partly the work of Bishop Luffa, and of other medieval Bishops of Chichester, whose summer palace it was – something of an episcopal conceit, rather than a serious military fortification. Nevertheless, if you descend the slope behind the church and look up at the great cliff of masonry, with jackdaws swirling around its dizzy battlements, the castle is still pretty impressive. One end of the ruin, almost the oldest part, is the present hotel and award-winning restaurant. To see it, bright and living, among so much tumbled stone, is rather like travelling back down the centuries, to a time when the past was the present. The high south face of the castle looks out over the wide-swinging Arun river and the Amberley Wildbrooks, an area that is sometimes marsh, sometimes stream and frequently flooded. The trains that run across the vast, flat plain look like toys, yet the embankments that carry them over the river and the treacherous ground were considered, when they were built in 1863, to be among the wonders of the Railway Age. No two houses are the same in Amberley, and each appears to have grown out of the edge of the road, gathering to itself the colours and materials – stone, brick, thatch, split flint, tile and timber – that happened to be available at the time of its creating. The streets of the village wind and twist to no particular plan, coaxing the visitor round each bend just to see what will happen next. It is all very peaceful, and past history is acknowledged only in a nostalgic sort of way by adding the prefix ‘Old’ to the names of the buildings. There is a stone-tiled Old Brewhouse, a thatched Old Malthouse, a bow-windowed Old Bakery, the Old Bakehouse with curling brick steps and a black and white Old Stack Cottage. Artists come with brushes and palettes to capture the enchantment of this show village; fishermen come to display their patience on the banks of the Arun; while botanists and ornithologists come to study the plants and wildlife of the Downs and the Wildbrooks which between them enclose this idyllic corner of Sussex.